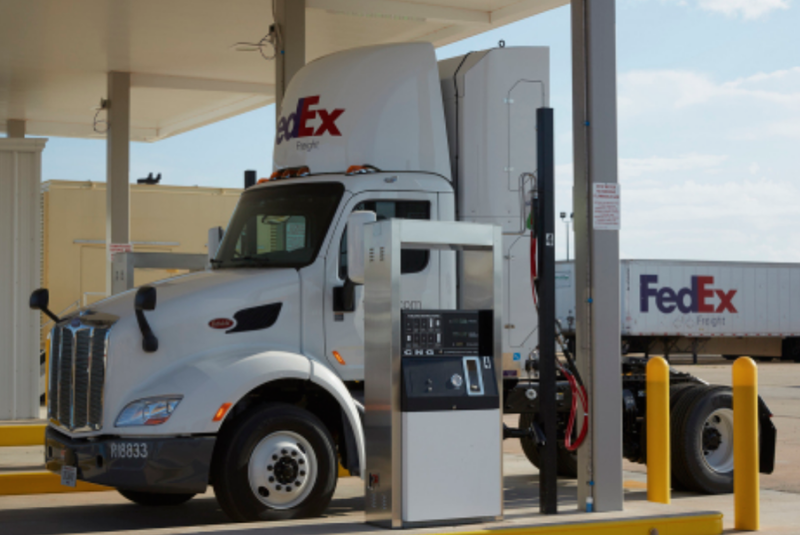 FedEx Freight, a leading U.S. provider of LTL freight services, has purchased more than 100 compressed natural gas (CNG) tractors and has installed a CNG fueling station to serve the new CNG fleet at its Oklahoma City Service Center. To get it done, the company contracted with Clean Energy Fuels Corp (Nasdaq: CLNE) to design, build and maintain the fueling station. The CNG fueling station in Oklahoma City ncludes a four-lane “fast fill” station which closely replicates a diesel fueling experience. Also on site is a “time fill” station which has six zones and 18 hoses. In time-fill applications, drivers connect their vehicles to an automated system in which the tractors are fueled over an extended period of time, typically overnight. The fueling station is estimated to dispense approximately 2.5 million gasoline gallon equivalents (GGEs) per year and will be showcased at a ribbon cutting ceremony October 11 by Oklahoma Gov. Mary Fallin, FedEx chairman and CEO Frederick W. Smith, Mr. Ducker, Clean Energy co-founder and energy magnate T. Boone Pickens, and Mr. Littlefair. CNG is made by compressing natural gas to less than 1 percent of the volume it occupies at standard atmospheric pressure.